With the economy still struggling, more small-business owners are turning to pawning valuables to supplement cash flow. NEW YORK ( MainStreet) -- Pawning dad's gold watch or grandma's broach may not be the first thing that comes to mind when seeking financing for a business, but a growing number of small-business owners are turning to this option because of a lack of financing available elsewhere. "The demand is getting stronger and stronger every day," says Todd Hills, CEO of Pawngo, an online pawn shop. "Small-business owners have a pretty direct plan: 'I need this money for X and this is how I am going to play it back.' Whereas a consumer comes to us because they've had some sort of unexpected life event happen." With the economy still struggling, more small-business owners are turning to pawning valuables to supplement cash flow. 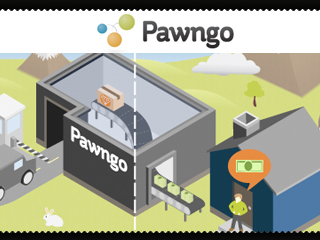 Pawngo offers an online pawn option. The company typically accepts small valuables and jewelry such as watches and gold coins in exchange for a three- to six-month loan. Common uses for the money by small-business owners includes payroll, equipment purchases, repairs or to grow their businesses. "In the past these business owners have had lines of credit, easy credit cards, home equity loans -- more formal banking relationships that with everything that has gone on with the economy, the credit is just incredibly tight and those options just aren't available," Hills says. On the same note, a lack of financing options continues to be the biggest reason in preventing small-firm M&A, according to a report last week from BizBuySell, a marketplace that lists and tracks businesses for sale. Approximately three-quarters of the brokers surveyed by BizBuySell said financing availability for business buyers has not improved this year. And 47% said a lack of available financing is the primary factor preventing transactions from closing these days. And sentiment seems to be getting worse. Mike Handelsman, BizBuySell's group general manager, said in a statement that while the company expected financing troubles to be a continued issue in closing acquisitions, "it's our feeling that the recent economic environment caused the surveyed brokers to respond more negatively than they might have just a few weeks prior." Survey respondents had a fairly negative outlook on the availability of funding, with 49% saying that the limited funding availability will remain as tough through the rest of the year. Another 42% say it will actually worsen through the end of the year, given the recent economic and stock market turmoil, according to BizBuySell. The National Federation for Independent Business' monthly index on small-business optimism dropped for the fifth consecutive month in July, by 0.9 points, to 89.9 (below the average reading of 90.2 for the last two-year recovery period), it said earlier this month. "Given the current political climate, the protracted debate over how to handle the nation's debt and spending and the S&P debt downgrade, expectations for growth are low and uncertainty is great," federation Chief Economist Bill Dunkelberg said in an Aug. 9 statement. "At the two year anniversary of the expansion, the Index is only 3.4 points higher than it was in July 2009."